Imagine easy boating! Sit back, grab a joystick and point it where you want to go. This might sound like science fiction, taking into account today's reality with a multitude of handles and buttons, but we will get there. The single most important thing to a boating experience is proper trimming. Every boat should have trim tabs and they should work automatically. The ACS fits all popular trim tabs on the market, both electromechanical and hydraulic. When people move about or the course is changed, ACS corrects! With the ACS, you will get on the plane faster and you can choose to drive any speed you want. The bow will be kept down to maintain visibility at all times. Make your trim tabs automatic! 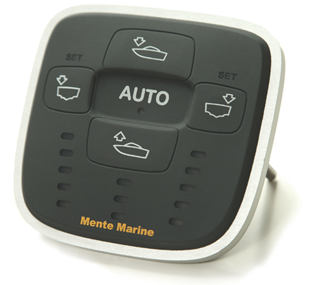 We were the first in the world to make trim tabs automatic using "mems" sensors that measure the movements of the boat. It was released in 2002, followed by product refinements over the years. Now, it has reached perfection. More precise measurements, faster trimming of the boat and a beautifully designed control panel. The dream has been to get everything into the panel. No cables, no boxes, no extra wires to connect. Just put in an automatic trim tab control panel instead of the traditional four buttons. It is smart! It senses your moves. Are you speeding up or slowing down? Driving straight or turning? Are you tying up or going out or even, perhaps, on a trailer? It will wake up when needed and go to sleep when needed. When on the plane, the ACS automatic trim system will keep your boat in proper trim without any guesswork from your side. Watch the video! See how the features of the ACS will help you!